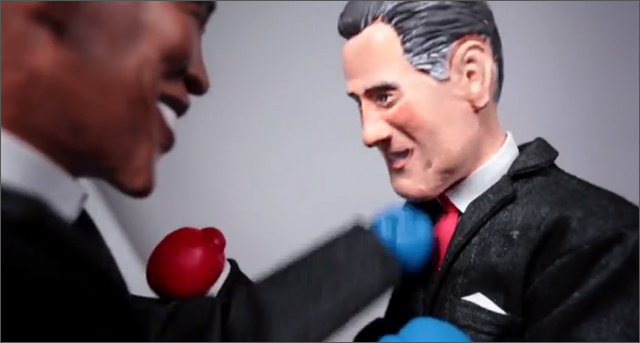 Agency Creates Twitter-Powered Presidential Puppet Smackdown? Santa Monica-based agency Ignition are set on moving the US Presidential campaign away from a mudslinging match into a puppet smackdown with ‘Smack a Candidate‘. Smack a Candidate consists of a Barack Obama and Mitt Romney puppet controlled by the posts of Twitter users. How does it work? When you hear something from one of the candidates that you don’t like, post a tweet with the hashtag #SMACKOBAMA or #SMACKROMNEY and the puppet will take of the rest. Smack a Candidate bouts will take place right up to election day November 6. Each round is recorded and can be viewed on the site, or watch live as the presidential punches fly. Toronto-area (Vaughan to be exact) auto dealer Pfaff Audi launched a competition today for Ontario Twitter users to earn a chance to win a tuned 2013 Audi W4. 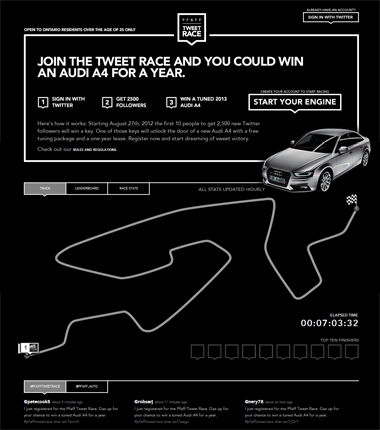 The Pfaff Tweet Race looks to reward the first 10 people to attract 2500 new Twitter followers with one of 10 keys that will open the door to a custom-tuned 2013 Audi A4. The contest ends on October 28, or once the first 10 finalists have been identified. Before you begin thinking that you can simply go out and buy 2500 followers to earn one of the keys, the rules state that all new Twitter followers will be verified. Although it’s not clear what method the organizers behind the contest will use. Thomas & King, Inc. owner and operator of 88 Applebee’srestaurants in Arizona, Indiana, Kentucky, Ohio and Pennsylvania has launched a new campaign to promote their ‘Life is Better Shared‘ motto. 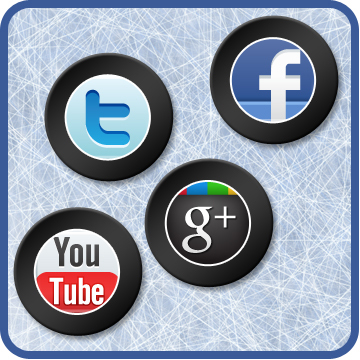 In the three clips the Girls Night Out Goddess interrupts three social media ‘experts’ looking to provide tips on using Pinterest, Facebook and Twitter with some social media tips of her own. 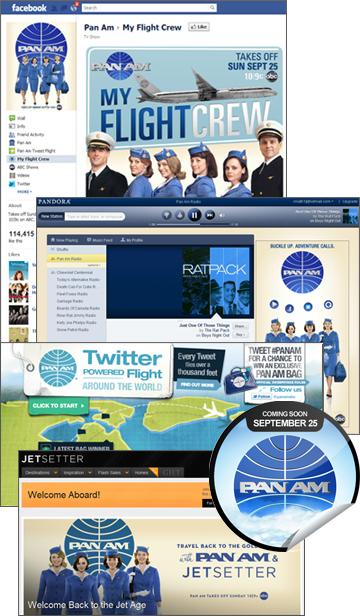 The campaign was created by Lexington, KY agency Cornett Integrated Marketing Solutions. There’s no denying that the SMART car is small. It’s so small that Smart Argentina has managed to fit the car inside of a tweet. 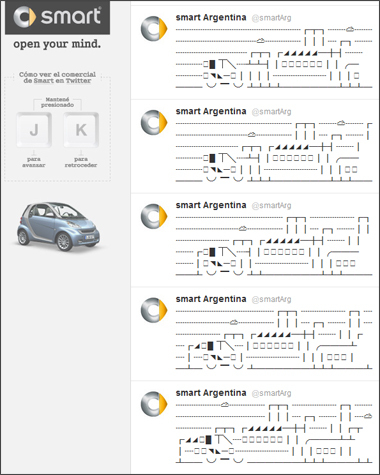 SMART Argentina has created a 455 tweet flipbook in their Twitter stream using ASCII and special characters to illustrate a SMART car driving through the city to find the perfect parking spot. The animation ends with the message ‘ENTRA EN TODOS LADOS HASTA EN 140 CARACTERES’ (Get everywhere up to 140 characters) and ‘UNA GRAN IDEA PARA LA CIUDAD’ (A great idea for the city). You can view the animation in your browser if you keep pressing the ‘J’ button (or down arrow) on your keyboard. If you like to watch the SMART car in reverse, use the ‘K’ or up arrow. If you’re not able to have the tweets scroll smoothly in your browser, they’ve posted a YouTube video of the full animation. The Denver Museum of Health & Science wants to create the world’s longest virtual snake and it needs your tweets to make it happen. 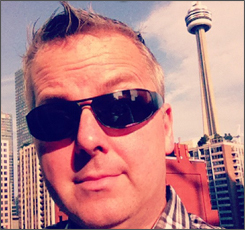 Every tweet you create with the hashtag #Tweetaconda adds to it’s length. 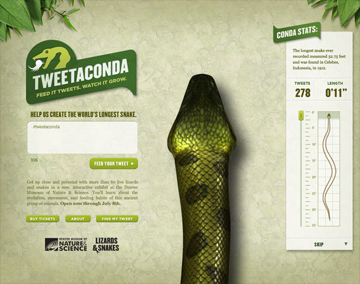 The Tweetaconda is part of a campaign promoting a new, interactive exhibit featuring more than 60 live lizards and snakes. You can use the hashtag anywhere to help the snake grow, but it’s worth creating a post on the landing page just to see the snake jump up and eat your tweet, and yes… it freaks me out every time. The exhibit is open until July 8th for the lucky folks in the Denver area. The 2012 Daytona 500 may have been delayed a day and a half by rain pushing the race to start on Monday night, but no one could have predicted what would happen late in the race. Somehow Target driver Juan Pablo Montoya suffered a mechanical failure during a yellow flag and crashed into one of the jet dryer trucks that were on track clearing away some of the rubber debris. Thankfully both Montoya and the driver of the truck were not seriously injured, but the ensuing fire caused burning jet fuel to flow across a critical section of the track resulted in an extended red flag. What followed will surely go down as another key event in the mainstreaming of Twitter. 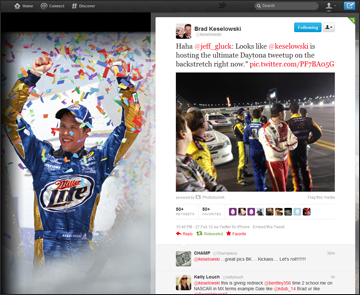 For some reason Brad Keselowski, driver of the Miller Light Dodge was carrying his iPhone with him during the race. As the race was red flagged he took this picture of the scene out of his windshield with the message “Fire! My view”. While track repairs went on, Keselowski continued to tweet, responding to fans and taking more pictures of other drivers, reporters and NASCAR officials. By the time the checkered flag fell for the ultimate winner Matt Kenseth, Brad who had been sidelined in a crash but was sitting just short of 200,000 Twitter followers. Keselowski is one of the most social media savvy drivers in NASCAR, and recently featured the names of 5,000 of his Twitter followers on the bed cover of his Dodge truck during Friday night’s Camping World Truck Series race. 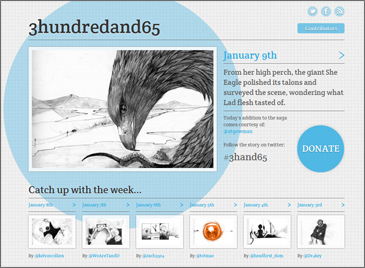 Artist Dave Kirkwood has a long year ahead of him as he creates a drawing each day for the 3hundredand65 project (yes, I know 2012 is a leap year with 366 days). Each day a new author will add to the story with a single tweet, then Kirkwood will create an original illustration based on that tweet. At the end of the year the sketchbooks will be auctioned off, with the price starting at £120; the cost of the sketchbooks. The project is in support of Teenage Cancer Trust, a UK charity devoted to improving the lives of teenagers and young adults undergoing treatment for various forms of cancer. The website was designed by Manchester design agency Corporation Pop. 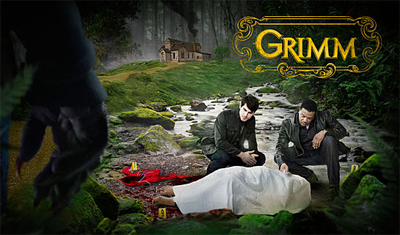 One of the most intriguing new shows this new TV season is the NBC fantasy-drama Grimm. The show follows Nick Burkhardt, a homicide detective in Portland, Orgeon – who discovers that he is a descendent of the ‘Grimms’. However, it turns out that the Grimms are not just the famous storytellers that everyone thinks they are. It turns out that the fairy tale stories they told about were real, and that the family line has had the important role of policing the balance of humans and the mythological creatures. Jacob and Wilhelm, the ‘real’ Brothers Grimm, released collections of hundreds of legendary fairy tales in the 1800s, so if the show does take off, the producers will have plenty of content to work with. NBC has taken a bold step to get the buzz rolling on social media by letting Twitter users watch the full-length premiere episode of Grimm simply by following @NBCGrimm. Viewers will then be send a DM with a unique code to unlock the video on the NBC site. The first episode plays around with the Red Riding Hood and Big Bad Wolf characters. It’s fast-paced fun as Nick starts to discover more about his family’s secret history. As I watched I couldn’t help thinking of the campy horror of the ‘Buffy the Vampire Slayer’ series. It will be interesting if the show can find it’s dedicated audience within the cut throat competition of network television. Grimm will premiere on Friday, October 28 at 9pm.